Life is divided into two parts: growing until the age of forty, followed by a decline until the age of eighty. Between the ages of twenty and thirty the changes are minimal, barely visible, but afterwards, everything changes very quickly. When Do We Start Ageing? 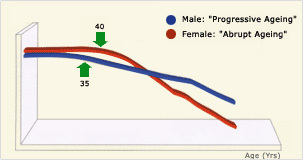 The serious decline begins around the age of fifty. This is the great upheaval, or the time of change. Beyond the age of fifty, a woman's menopause may occur over a period of less than two years, and the sexuality of a man over fifty can be completely transformed in a few months, especially after the first instances of sexual decline which reinforce his self-doubts. 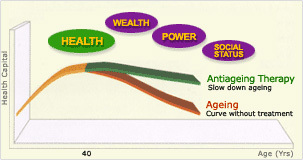 Ageing is mainly caused by hormonal imbalance. Hormonal, secretions of the living cells, have a stimulatory and regulatory effect on certain organs of the body and behave like a set of keys that are capable of opening different doors. They are carried by proteins via the blood stream to various parts of the body, resembling a river that irrigates every part of the land. Just as water is the source of life, hormones are the source of youth in the human body.
" The same rule that applies to running a company is true for the "management " of our body. A well-organised structure regularly maintained is always better than crisis management. "